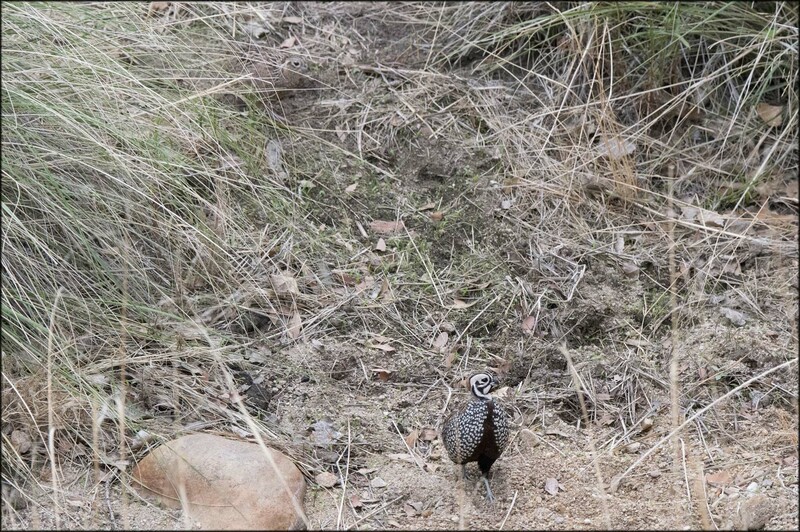 As we drove the 20 minutes back to the ground feeder, I thought about how many times I had tried to find these Quail. 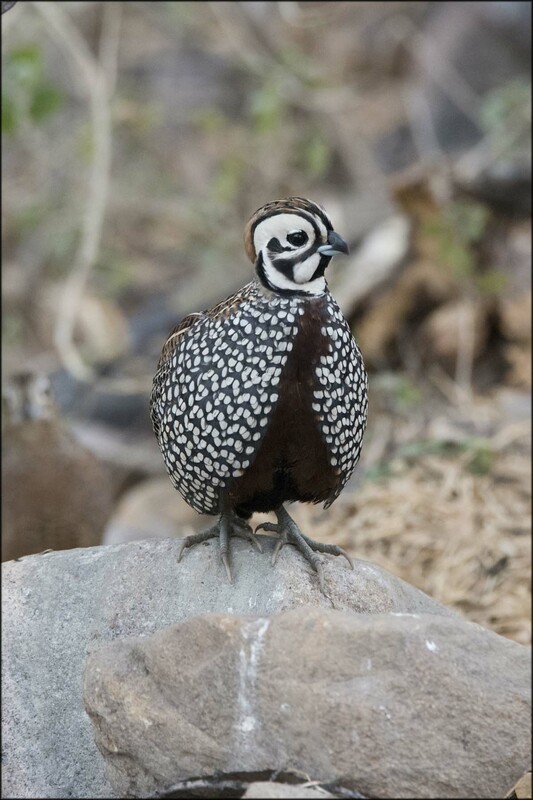 This was my 7th time in Arizona plus 3 trips to Texas, and each time I had a chance to see one, but these birds are tough. As we arrived, we hurried to the back porch and sat down, as this was our second to last chance and we only had so much time because I wanted to go to Ash Canyon to try and photograph the Lucifer Hummingbirds that were coming to Mary Joe’s feeders, but I am getting ahead of myself. 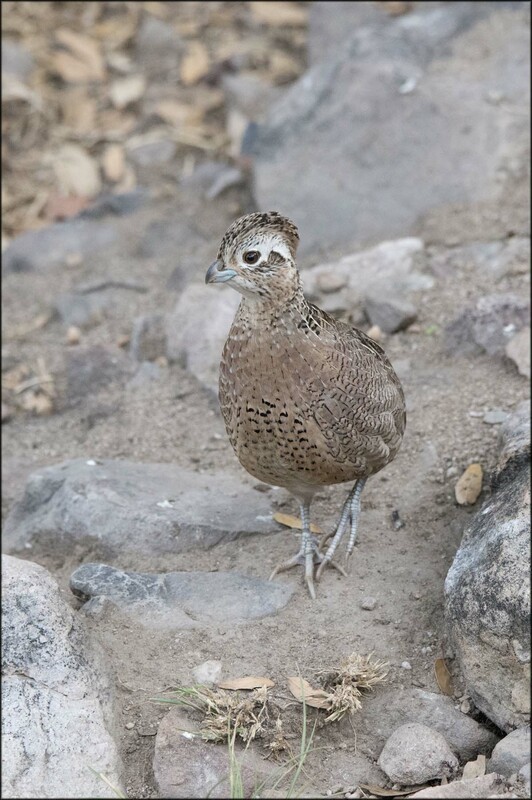 We had decided that Rick would stay at this location because the Quail was a lifer for him but I needed a photo of the Lucifer. I was going to stick with him for 2 hours until 5 pm, head over for the Hummingbird and then pick him up so we could go for the Elf Owl at 9 pm. Sounds confusing, doesn’t it? The two hours went by quickly and there was plenty of action but not the kind we were looking for. 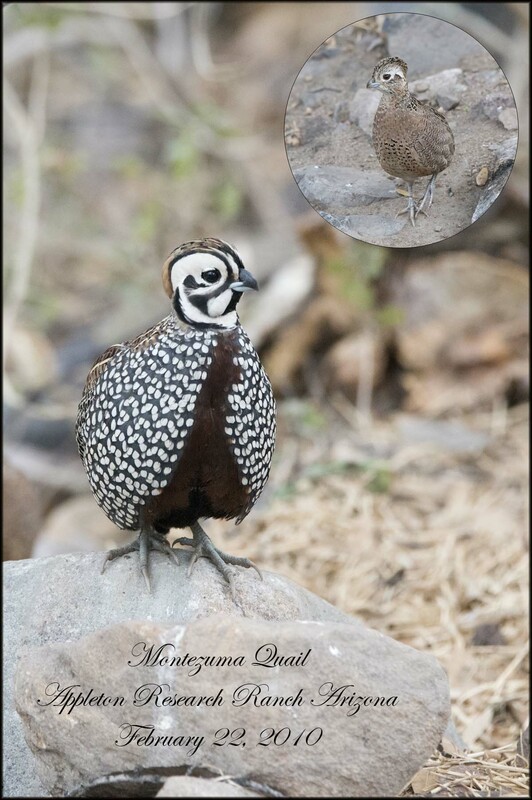 About 10 minutes before I was to leave we began hearing a male Montezuma calling and it seemed to be coming closer. More calling and even closer but I just didn’t see any movement. 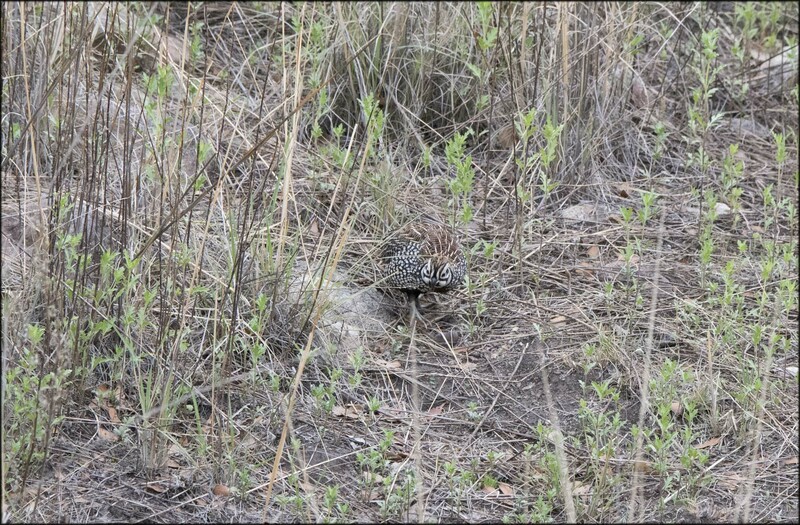 Then it suddently appeared about 100 yards out – I caught movement, and the camera came up. 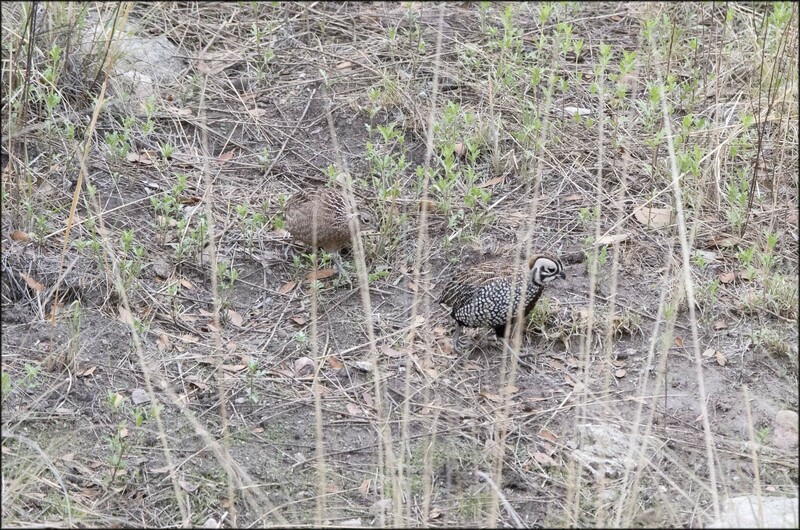 I saw it bare-eyed but I could see only the quail’s crest so I will let the photos do the talking from here. In the span of 5 minutes, from when I first saw them, they came in a, had a drink of water and then were gone. Rick got some great video footage and I had the photos I had dreamed about. I think we both had such an adrenalin rush we were shaking. You can hear me taking photos but very slowly. I will put out a thread about going for the hummingbirds later, but for now let’s jump forward to 9 pm. We met Tony Battiste at his home, Battist’s Bed, Breakfast and Birds. He had an Elf Owl living in his back yard and had invited us to come and have a look. 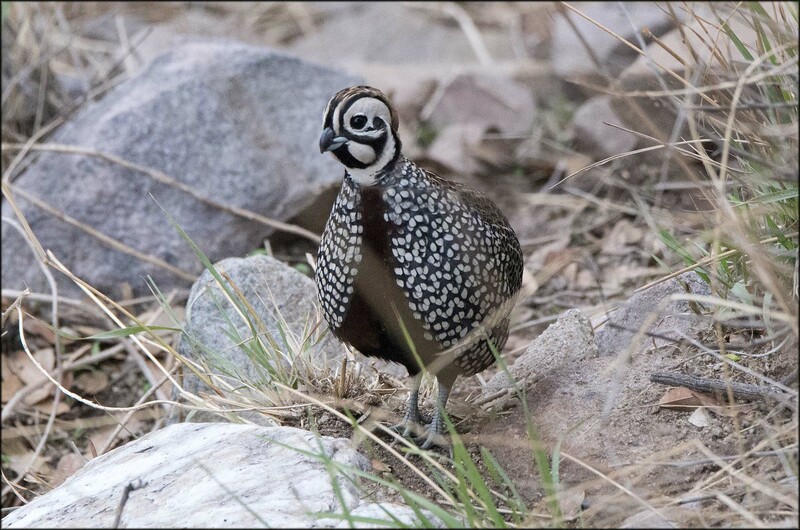 I wish I had been able to get a photo of his yard, it is birder & photographer friendly. He is an avid birder and he knows where the birds can be found locally. 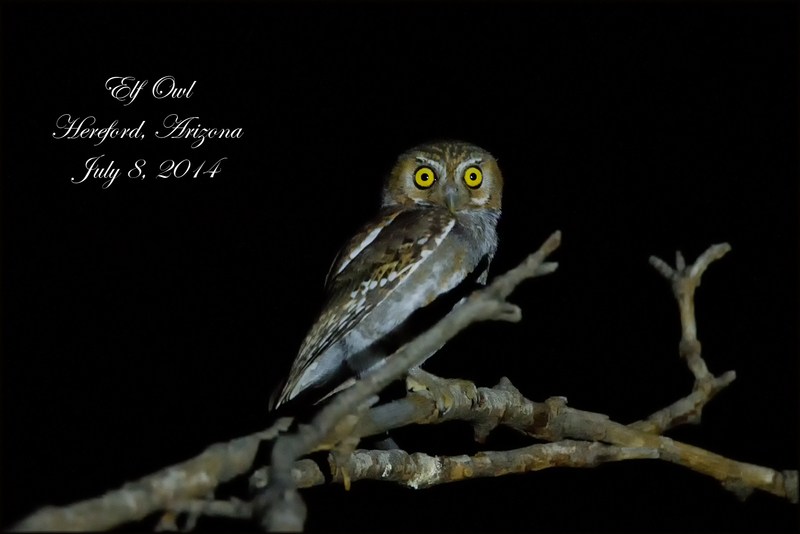 We sat down in his yard and within minutes we heard the owl, so on went the flashlight. The bird just sat there as it was accustomed to the light. I used way too high an ISO but it did not matter, another lifer was in the books. This Owl is only 5 3/4 inches tall a little bigger than a medium Tim Horton’s coffee cup. A big Thank You to Tony and Julie for the opportunity to see this lovely bird. This entry was posted in Birds, Bucketlist, Trips. Bookmark the permalink.